Last week at R&D Foods in Prospect Heights, Brooklyn, I got a quesadilla that was just perfection. 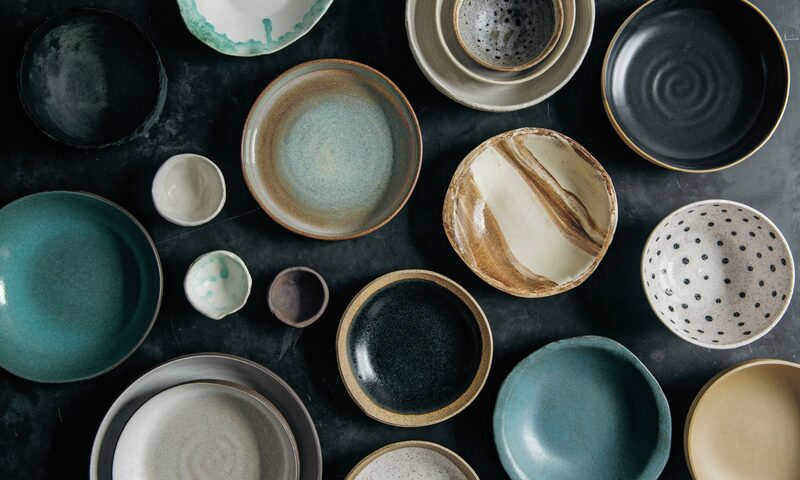 These types of assembled lunch meals can seem so simple—R&D has a creative, flavor-forward menu and is very mindful about ingredient sourcing, but the set-up is loosely based on the same model as a sandwich shop or deli, where all the sauces and fillings are prepped and pre-made, so that sandwiches only need to be assembled and heated up to order—but it’s so easy for things to go wrong. When the ingredients are fresh, flavorful, and used in balance; when the sandwich (or in this case, quesadilla) is heated properly to create all the right crisp and gooey textures and isn’t flecked with the burnt bits of fifteen other meals that were cooked on the same sandwich press; and when it hasn’t been sitting in a paper bag for very long, so that when it’s unwrapped from the parchment and eaten out of hand on a park bench, in a patch of some of the last of the hot, early-afternoon sun for the year . . . In other words, when every little detail is exactly right, it can make a person pretty happy to be alive. Such was my Friday afternoon. 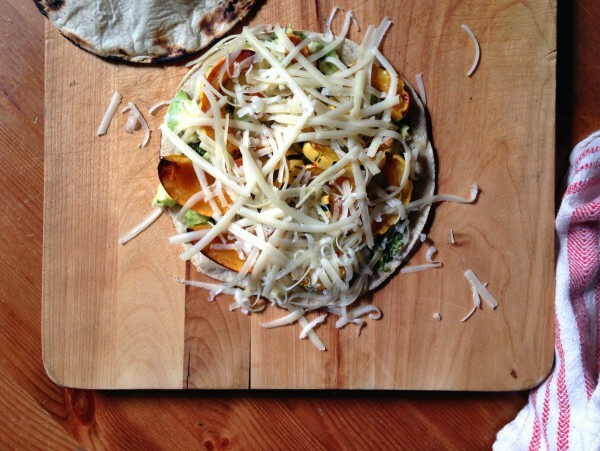 The R&D quesadilla is filled with delicata squash, a thick and ricotta-like pumpkin seed puree, pepper-jack cheese, and a scattering of perfectly toasted pumpkin seeds, with a little cup of fresh tomatillo salsa on the side. I couldn’t wait to make a version of it in my own kitchen. 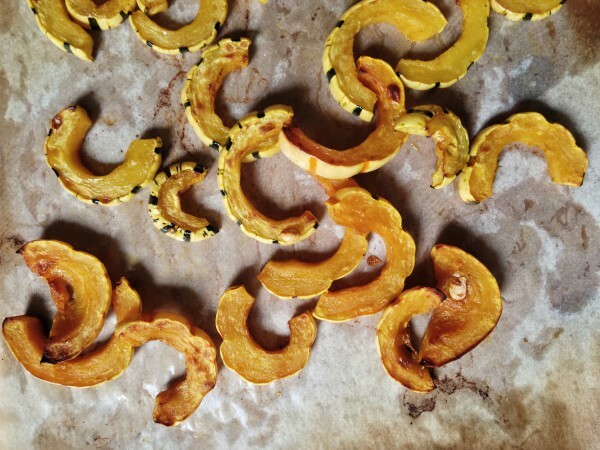 I loved the idea of using delicata squash, which is easy to find right now at the farmers market, and the pepitas are such a natural pairing. In this adaptaion you’ll pound them into a pesto-like spread with cilantro, a hot chili, and lime juice, then serve it on blistered corn tortillas with the roasted delicata squash, mashed avocado, and some good-melting cheese. And when I saw adorable “purple tomatillos” at my grocery store—which are about the size of big cherry tomatoes and, where I bought them, had no husk—it was the right opportunity to make tomatillo salsa. Combined with a red rather than green hot chili, hey gave my salsa a reddish-purplish hue. The bright, fresh flavor is a perfect pairing here. 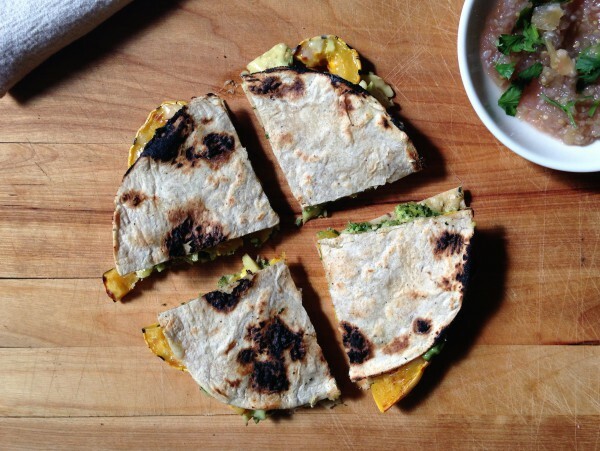 This recipe is for 4 quesadillas, but as you’ll see, once the squash is roasted and pepita-cilantro spread is made, it’s the kind of dish that can be easily thrown together for a perfect solo lunch or dinner. If you want to make it with larger flour tortillas, use only 4—arrange the fillings over just half, then fold the other half of the tortilla on top. And a creamy goat cheese, feta, or even a firm Mexican cheese like cotija would be good here, though I really like the melting properties of cheddar and jack. 1. Preheat the oven to 400 degrees Fahrenheit. Trim the ends off the squash. Slice them in half lengthwise and scoop out the seeds with a spoon. Lay them flat on a cutting board and cut into half-rings about 1/2-inch thick. (It’s not necessary to peel this squash.) Arrange in a single layer on a parchment-lined baking sheet. Drizzle with 1 to 2 tablespoons olive oil and sprinkle with a few pinches of salt. Toss with your hands to ensure that they’re evenly coated. Transfer to the oven and roast, stirring once, until just tender, 10 to 15 minutes. Test by piercing with a paring knife. 2. Meanwhile, spread the pepitas in a dry skillet and place over medium heat. Toast, swirling the pan frequently, until they begin to turn golden-brown and pop, 5 to 10 minutes. Cool. 4. This is an optional step, but it adds some smoky flavor to the quesadillas: Place the tortillas directly over a medium-high gas flame on a rangetop. Carefully flip them every 5 to 10 seconds, until the begin to char and blister on each side. 5. 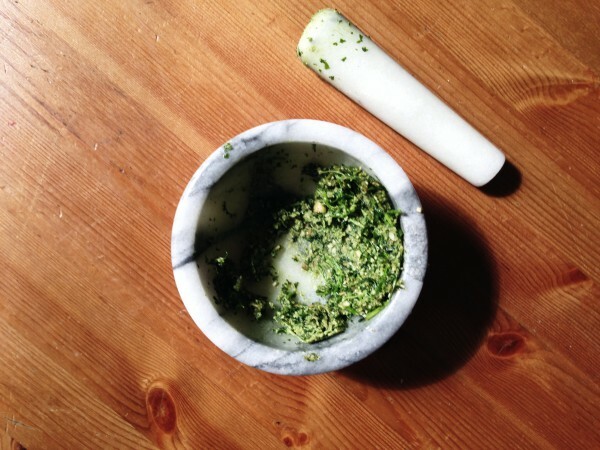 To assemble, spread a heaping tablespoon of the pepita-cilantro spread on four tortillas. Divide the mashed avocado on top, followed by a flat layer of squash and the shredded cheese, then top with the remaining 4 tortillas. Press on each tortilla gently to make the fillings cohere a bit. 6. You’ll need to cook the quesadillas one at a time: Place a dry skillet over medium heat. Lightly brush the outside of a tortilla with olive oil, then place it, oiled-side down, into the skillet. Brush the top quesadilla with a bit of oil. Cook for 3 to 5 minutes, then flip and repeat on the other side, until the fillings are hot, the cheese is melted, and the tortillas are crisp and lightly golden. Cut into quarters and eat immediately, with salsa on the side. The following recipe is barely adapted from this Epicurious recipe. Combine the tomatillos, garlic, chili, onion, salt, and 2 tablespoons water. Pulse a few times until coaresly combined. Transfer to a small saucepan. Bring to a simmer and cook for about 10 minutes, until slightly thickened. Cool then add 1 teaspoon lime juice. Taste and adjust the lime and salt as needed. Stir in the cilantro just before serving.